Local language films enjoyed another solid session as China’s summer ‘blackout’ period neared its end last week, with new China-Hong Kong co-pro The Bullet Vanishes opening to $12.9 million, and holdover The Silent War adding $11 million to become only the third Chinese language film this year to cross the lofty $30 million box office threshold. 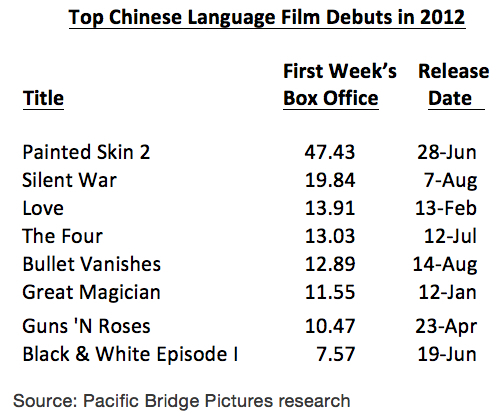 Four of 2012’s five best Chinese language film debuts have occurred during the past eight weeks, when the PRC has been enforcing its ‘domestic film protection’ period. 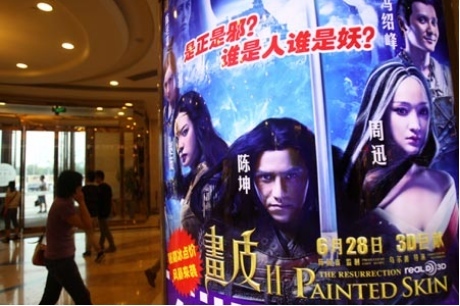 By all measures China’s film czars can rightly consider the protection period a smashing success for local films, which have racked up $300 million in ticket sales and a 73 percent share of China’s total box office during the past eight weeks. 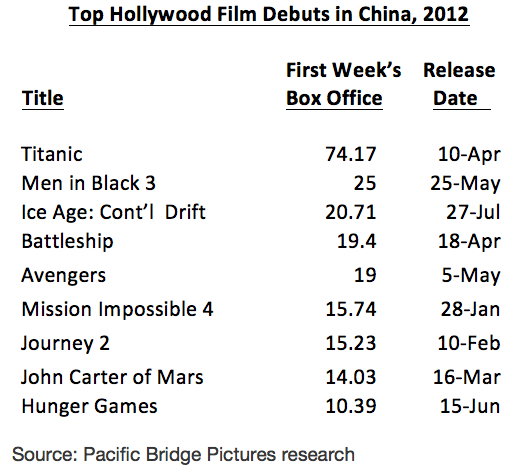 Compare this with just $60 million in ticket sales and a 17 percent box office share for Chinese films during the eight weeks immediately prior to the blackout. The head of the China Film Critics Society, Zhang Boqing, also protested the blackout, asserting that the key to protecting domestic films lies in improving their quality, not in imposing protectionist measures. And Shenzhen based film critic Gu Yan said the existence of the protection month reflects how little confidence the Chinese film industry has in its own products. Although the blackout has also been frustrating—and costly—for Hollywood’s majors (the embargo has effectively reduced U.S. films’ box office share from 67 percent to 54 percent for the year so far), they should all be thankful that the scheme succeeded. If it hadn’t, SARFT would likely have imposed more radical, and perhaps even punitive, measures to balance the playing field. For now at least, U.S. distributors can take comfort that their films will be allowed some latitude going forward. At least, that is, until Golden Week starts in October. This entry was posted in Analysis, Box Office Reports, General News and tagged China Film Critics Society, Chinese film protection, Gu Yan, Pacific Bridge Pictures, Rob Cain, Robert Cain, SARFT, Weibo, Zhang Boqing by chinafilmbiz. Bookmark the permalink.